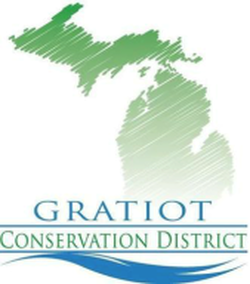 The Gratiot Conservation District (GCD) teamed up with the Ruffed Grouse Society Drummer Fund, the Michigan Dept. of Natural Resources (DNR), the American Woodcock Society, and the Andy Amman Chapter of Ruffed Grouse Society to provide funding for projects designed to revitalize the breeding habitat of American Woodcock at several site locations on GratiotSaginaw State Game Area (SGA). This project continues on previously-established sites where the (DNR) began clearing the land in 2013. The goal of the project was to increase woodcock reproduction rates by providing a large complex for optimum breeding habitat. American Woodcocks are migratory birds with restricted breeding habitat requirements to successfully reproduce. These include courtship, nesting, feeding, and roosting cover. The optimum time for work is during the winter when the ground freezes due to the wet soils inherent with woodcock habitat. The work that started in the summer of 2017 will continue as part of a larger DNR-funded Wildlife Habitat Restoration Grant and the GCD will continue applying for funding to further the work in years to come.